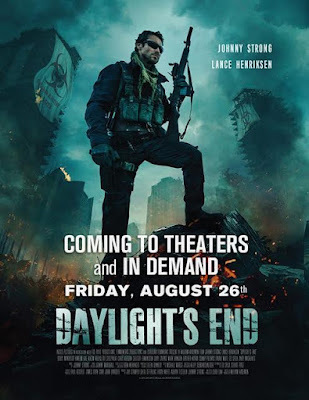 'DAYLIGHT'S END' is a post-apocalyptic thriller. From director William Kaufman and writer Chad Law, this title recently had its World Premiere at the Dallas International Film Festival. As well, Daylight’s End had appearances at the Dallas Comic Con (May ‘16) and the Comicpalooza, in Houston (June ‘16, Best Picture). The film stars: actor and composer Johnny Strong, long time sci-fi and horror vet’ Lance Henriksen, MMA fighter Krzysztof Soszynski, prolific actor Louis Mandylor, Gary Cairns and many more. Now, the film is slated for a twenty city theatrical run, this August 26th, 2016!